This level has easy difficulty and you need to play with trick to complete this level within few moves. First play with top part of the board and make striped candies. 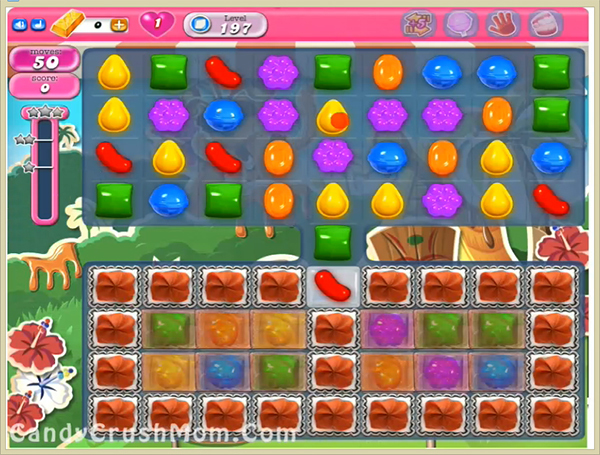 Then break striped candies horizontally to break jellies with wrapped candy on bottom part of the board. After use wrapped candy to break lot of blockers on bottom part of the board and break all jellies. We completed this level with 141820 score using same trick that we posted above and got two star score plus reach requirement within 40 moves.